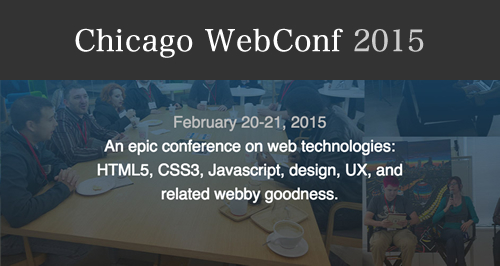 I had the opportunity to attend the Chicago Web Conference over the weekend. Here are some of the highlights from the sessions that I attended. One of the highlights for me was his example of using an SVG logo and then targeting elements within the logo with media queries and CSS for responsive to adapt the logo for mobile without switching to another image! He also shared his tricks for dealing with pesky Internet Explorer. Presenter was Rachel Baker from 10up. She shared how the API was conceived and the process of it’s development. It’s currently in the form of a plugin but they are working to include it in a future Word Press release as part of the core. http://wp-api.org/ The API can be used for things like displaying and managing content in a mobile app, integrating content with other applications and/or managing content on a separate Word Press site or another site within a multisite network. Many possibilities here. ZURB Foundation is a mobile-first responsive front-end development framework similar to Twitter Bootstrap. He showed some examples and how it works together with Bower and Grunt which are tools that can be installed with the command line that help manage and run tasks locally. Keynote: What Are You Built For? Overall the conference was good! One of the main sponsors was 37signals. They are the creators of Basecamp. We received 2 free books that were written by Jason Fried and David Heinemeier Hansson founders of 37signals. REWORK which is a contemporary look at running a business and REMOTE:Office Not Required which looks at the advantages and challenges of working remotely and how this is possible with the advances of modern technology. Both books offer insights and tips on being more effective, productive and happy in your work.